Danforth Wedding Jewelry is Refined, Not Mined! When you buy an engagement or wedding ring from Danforth Diamond, you are supporting the global effort to preserve our planet's future. From recycling newspapers to choosing the right light bulbs, being green and buying green are responsible choices that will help save the planet and its resources. But did you know you can be green with your jewelry choices, too? In a business where all of our products come from the Earth, the jewelry industry relies heavily upon mining companies to generate source materials for their products. The sad fact is — mining is a very "dirty" business and the production of one beautiful gold engagement ring will generate five tons of environmental waste, contaminating water and lands which endangers the health and lives of humans and animals. Danforth Diamond will NOT play a role in the Earth’s destruction just to create beautiful jewelry. Instead of sourcing our metal from mines (like some of our competitors), we choose instead to help preserve the planet by creating our engagement rings from HARMONY recycled precious metals. 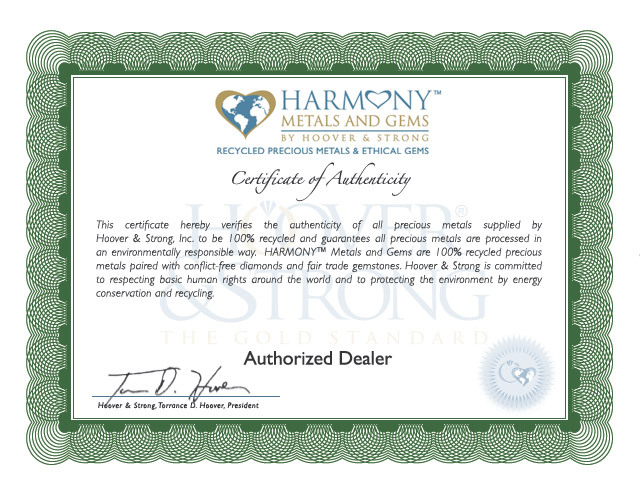 The 100% recycled guarantee comes backed up by the Certificate of Authenticity, which we proudly display on our website, as an Authorized Dealer of HARMONY Recycled Precious Metals™. View the Certificate at actual size. Additionally, all of the diamonds offered on our website are ethically sourced and conflict-free. We support the Kimberly Process and will not buy or sell "blood diamonds" for our engagement rings. Do Your Part to Save the Earth and Buy Eco-Friendly Jewelry and Engagement Rings from Danforth Diamond! Be sure to look for the HARMONY logo throughout our website when shopping diamond engagement rings. 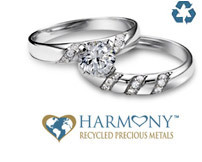 Please note that all items made with HARMONY Recycled Precious Metals™ will come shipped to you with the official HARMONY Mini-Certification Card. *HARMONY Recycled Precious Metals™ come exclusively from Virginia-based company Hoover & Strong. An industry leader in environmentally-friendly jewelry manufacturing and refining, Hoover & Strong is committed to respecting basic human rights around the world and to protecting the environment by energy conservation and recycling. All of their products are guaranteed 100% recycled and are processed in their state-of-the art environmentally-responsible facility. Please note that a small percentage of our products come from other vendors. We cannot guarantee those metals to be 100% recycled.